'Palestine Papers,' Day Two: Leaders 'Gave Up Fight Over Refugees' : The Two-Way Palestinian Authority officials have challenged the accuracy of the leaked documents. Their rivals are accusing PA leaders of treason. 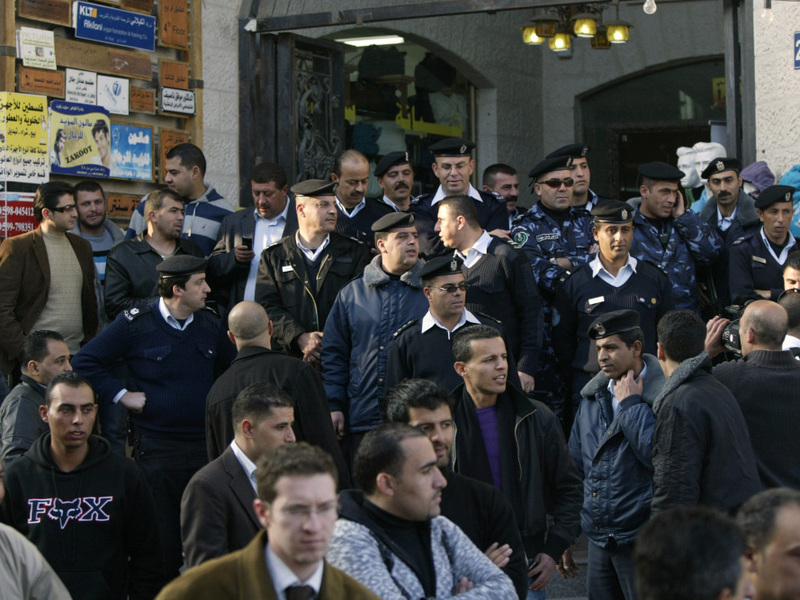 Palestinian police officers blocked the entrance to the Al-Jazeera TV office, after protesters vandalized it, in the West Bank city of Ramallah on Monday (Jan. 24, 2011). — Al Jazeera: The Palestinian Authority has been "selling short the refugees." — The Guardian: "Papers reveal how Palestinian leaders gave up fight over refugees." "Palestinian negotiators privately agreed that only 10,000 refugees and their families, out of a total refugee population exceeding 5 million, could return to Israel as part of a peace settlement, leaked confidential documents reveal. PLO leaders also accepted Israel's demand to define itself as an explicitly Jewish state, in sharp contrast to their public position." "After the initial broadcast on Sunday evening, Abbas aides challenged the authenticity of some of the documents and said quotes were taken out of context, as part of what they described as a smear campaign against the West Bank leadership. Saeb Erekat, the chief negotiator, reiterated those allegations Tuesday."